Reinforcing mesh is produced to highest quality standards and complies to ISO 9002. Thorough testing of wire strength, welds and aperture sizes is continuously performed at all stages of the manufacturing process. Final inspections ensure that highest standards are maintained. Reinforcing mesh is available in rolls (60m x 2,4m) and sheets (6m x 2,4m), manufactured according to standard sizes. Wire diameters vary from 3,55mm to 12mm. Mesh aperture can be as small as 100mm x 100mm. Specialized machinery is used to produce weld mesh with non-standard aperture sizes. The spacing of wires in either direction is variable between 25mm and 150mm. 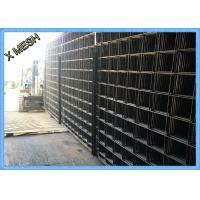 Customized mesh is available on request according to specifications provided. The MR Reference Number is the nominal mass in kilograms per square meter multiplied by 100.
both in size of wires and spacing. Hard drawn wire to British standards 4482 has a minimum breaking strength of 510MPa and a minimum yield point of 485MPa.